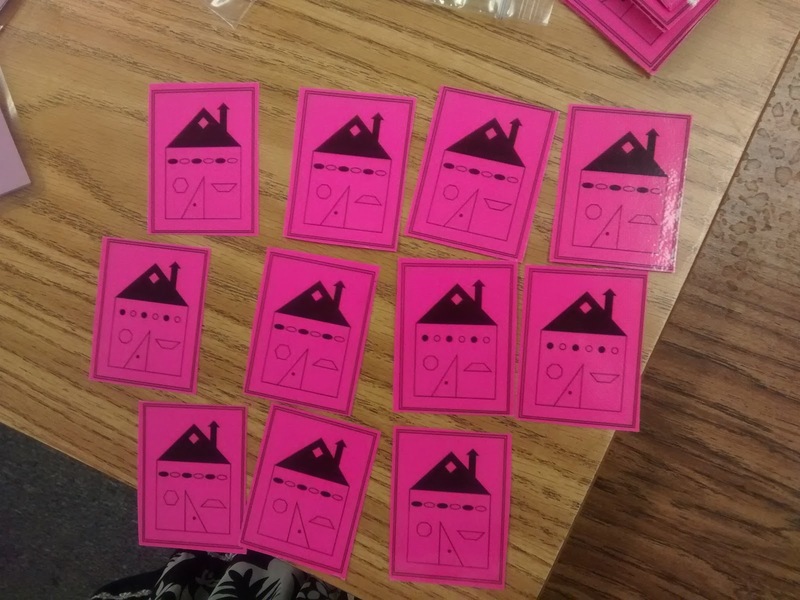 This has been an exciting week because I started number talks for the first time. 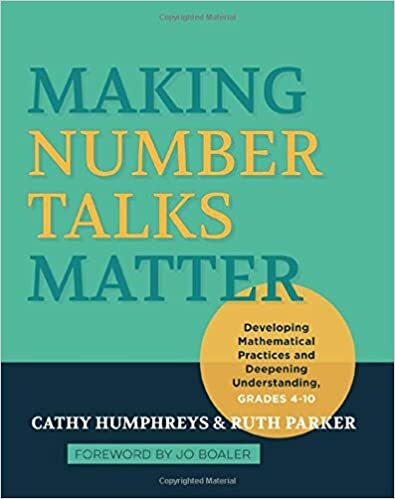 This summer, I read Making Number Talks Matter (affiliate link) after hearing it recommended over and over and over by the #MTBoS. And, the book definitely lived up to all of the hype! I read the entire book in two days. It was just that good! Before I decided to jump in and buy the book, I watched several awesome youtube videos about number talks. I'd recommend this video by Sherry Parrish and this video by Jo Boaler. I also highly recommend this blog post by Sara VanDerWerf. I'd heard a lot about number talks, but I always dismissed them as something I didn't have time for. 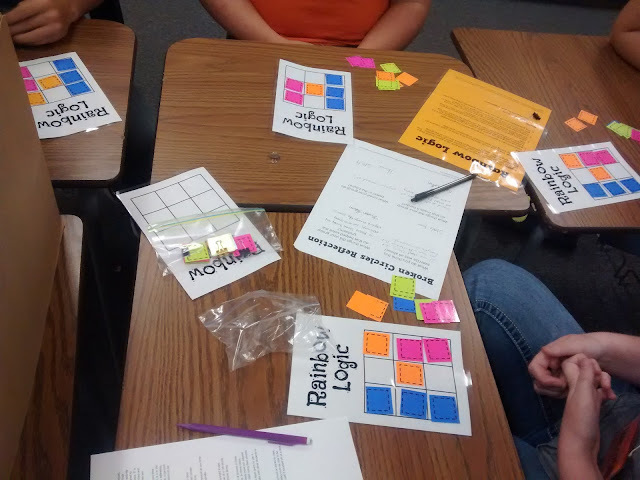 When I found out this summer that I would be teaching a math concepts class (a class for 9th graders not yet ready for Algebra 1), I was excited because I knew I would finally have time to try out number talks. As I started to read the Making Number Talks Matter (affiliate link) book, I began to realize that I need to do these in all of my classes. One thing I especially love about this book is it's written for teachers of grades 4-10. So, it shows how these seemingly elementary math concepts apply directly to the high school math classroom. 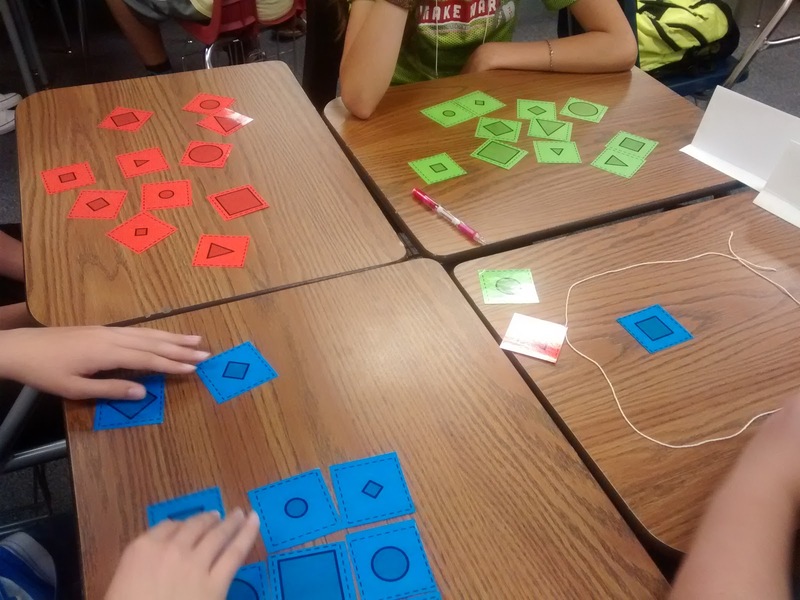 Plus, my students need serious work with these "seemingly elementary math concepts." I've decided to make mental math my big focus of 2016-2017. And, number talks are how I'm going to provide my students with practice. The authors of Making Number Talks Matter suggest starting with dot talks when you first introduce number talks because it's a problem that all students can participate in. 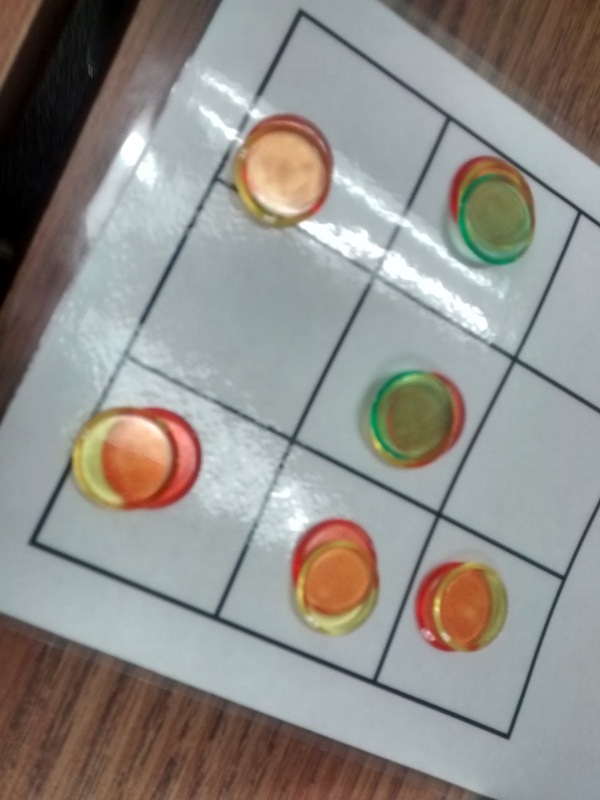 I wasn't sure how my students would take to the dot talks, but they have been LOVING them! It's been eye-opening for me to see the different ways my students see things. And, kids are begging to share with the class how they saw the problem. I'm trying to keep them short (5-7 minutes), but I know it is time well spent! It's also a good sign when they're sad that they only get to do one each day! I have pictures of all our dot talks so far, but they're on my school computer. So, you'll just have to take my word that my students are doing an awesome job! ;) We'll be doing two more dot talks this week. 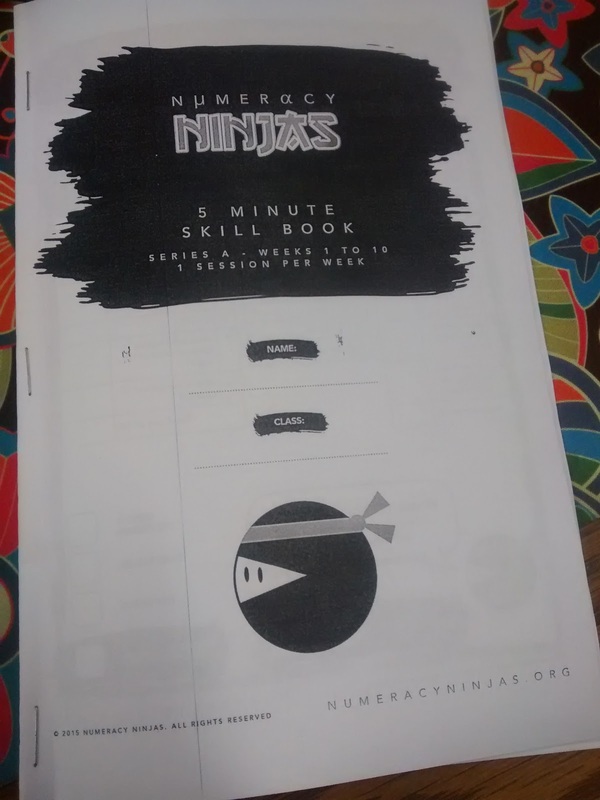 On Fridays, we'll be doing a 5-minute Numeracy Ninja test. Numeracy Ninjas is an awesome free UK numeracy building resource. 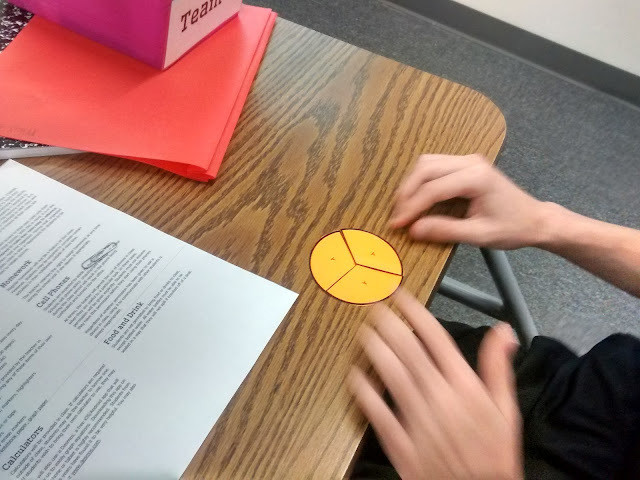 I know that timed tests are controversial, but I want my students to be able to see that their mental math skills are building as the year progresses. I want them to see number talks as useful and productive conversations. I printed them in booklet form on letter sized paper, folded them in half, and stapled them on the folded edge. Next week, I think we'll jump into subtraction problems first. I'll be sure to report back with how it's going! I'm so excited that I'm actually doing something about my students' numeracy skills this year instead of just complaining about their lack of numeracy skills. The craziness of back to school has finally got to me! 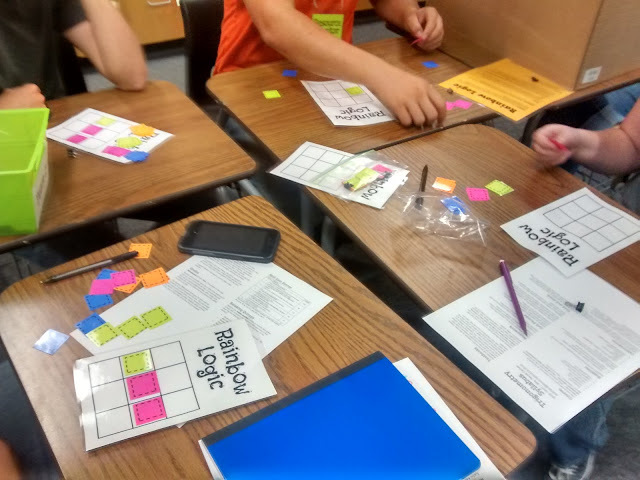 So, for today, I'll be sharing some of my favorite #Teach180 tweets from the past couple of weeks. So many inspiring ideas! I wish I could have included all of the posts, but I had to choose just a few. 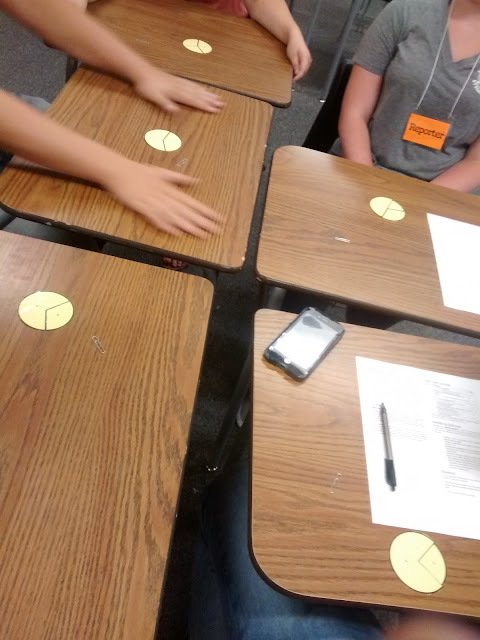 Be sure to search for #Teach180 on Twitter to see all of the posts! You may have to wait a few seconds for all of the pictures below to load since they're embedded from Twitter. 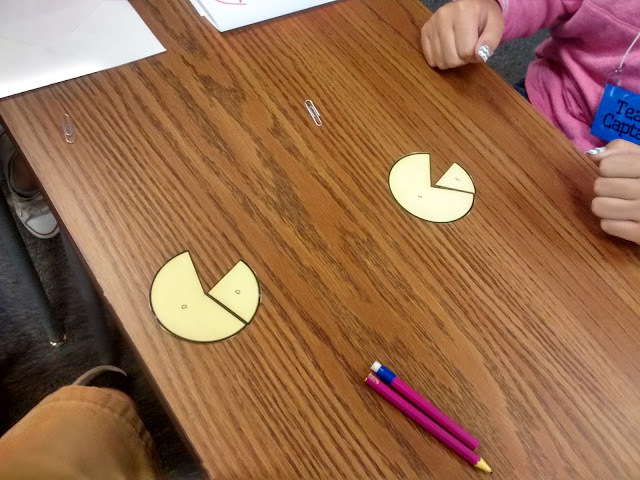 I love this visual patterns problem! So, if I'm honest, I don't exactly know what's going on here. But, it looks so interesting! I can't say enough good things about Sarah VanDerWerf's 1-100 activity! I blogged about how this went in my own classroom here. 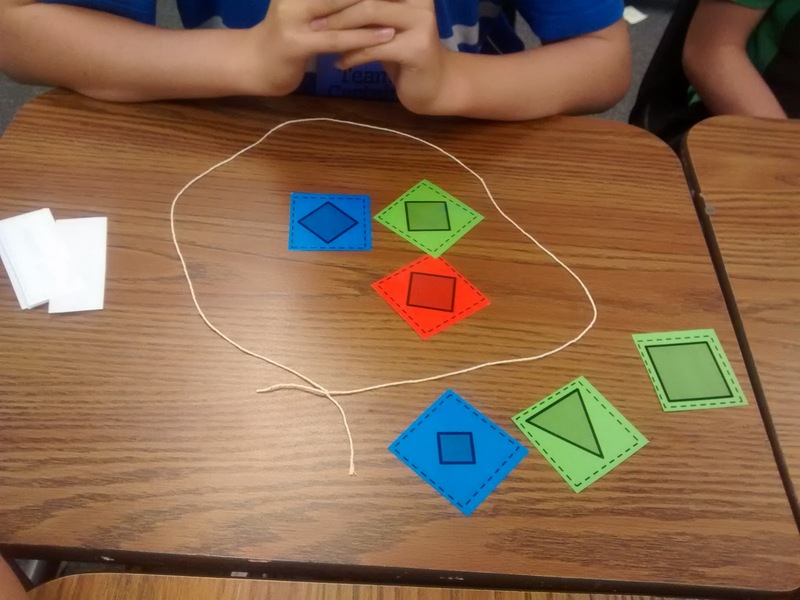 This order of operations matching activity looks fun! I'm teaching trig this year, so I can't wait to engage my students in some Always, Sometimes, Never! If you spend much time around my blog, you'll quickly find out I love Slope Dude. I even made Slope Dude posters this year! This makes me want to give my students a comic strip assignment! I'm also super excited that my husband is doing interactive notebooks this year for the first time! I've seen so many great growth mindset ideas lately like this? I love an "I have...Who has?" activity. 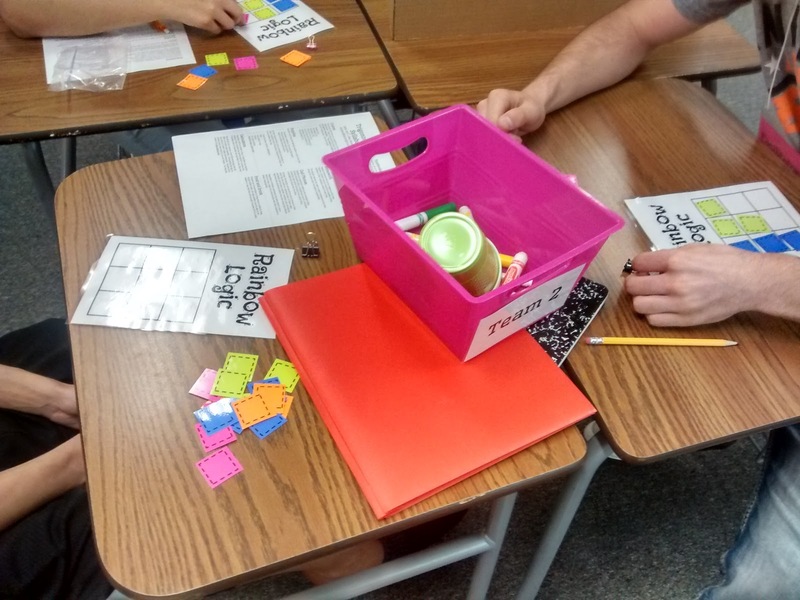 I'm not teaching geometry this year, but I can use the same idea for other classes. You can't look at this and not be happy! 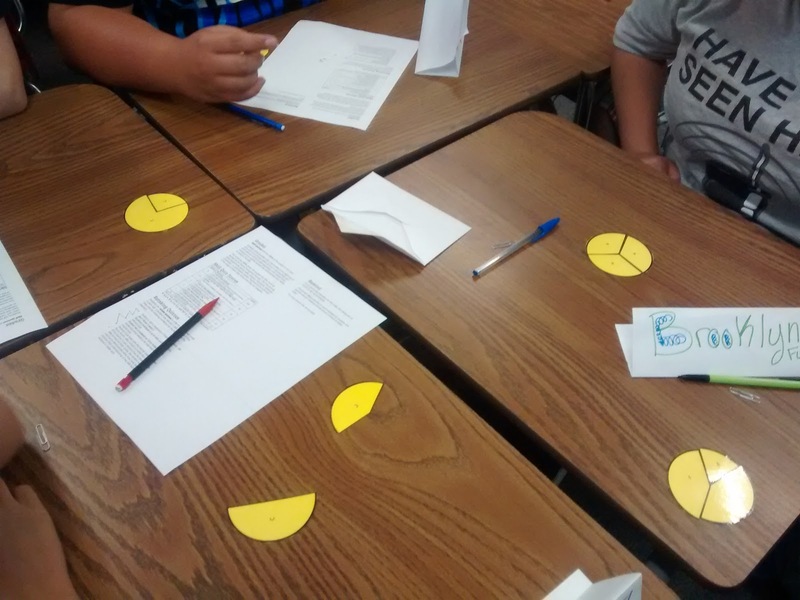 Since I'm teaching physical science this year, I'm paying a lot more attention to the #Teach180 science tweets! I love me so labeling and color coding! I'm including this post because I need to remember to get out my shower curtain coordinate plane. I actually have room to lay it out in my new room without rearranging the desks! @mathequalslove i made the coordinate grid out if the shower curtain and duck tape. I love when students name things and form attachments to things in the classroom. It just makes teaching so much more fun! This idea for privacy shields is brilliant! Need to keep this idea in my mind for when we start unit circles in trig! What a gorgeous, inspiring classroom display! I've done this activity before, and the responses from students are priceless! Jennifer's use of post-it notes here is awesome! I MUST remember this activity for our polynomial chapter in Algebra 1! Shawna had her students make their own fair spinners in geometry. I've been wondering how I could use something like this when I teach stats next year. I've always wanted to try this activity! I actually tried this problem with my physical science students during the first week of school! I hope you found some inspiring ideas, too! Quick post today because it's late and I'm exhausted from a full day of teaching and an evening at the Tulsa Math Teachers' Circle. 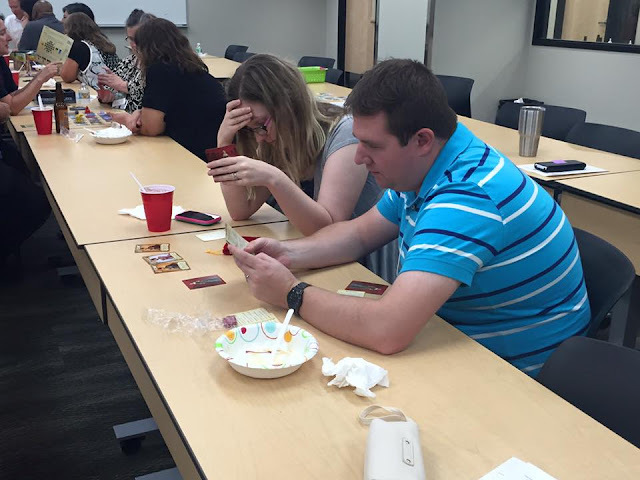 We had an ice cream social tonight with board games. So fun! We're obviously focusing super hard on figuring out how our game worked. 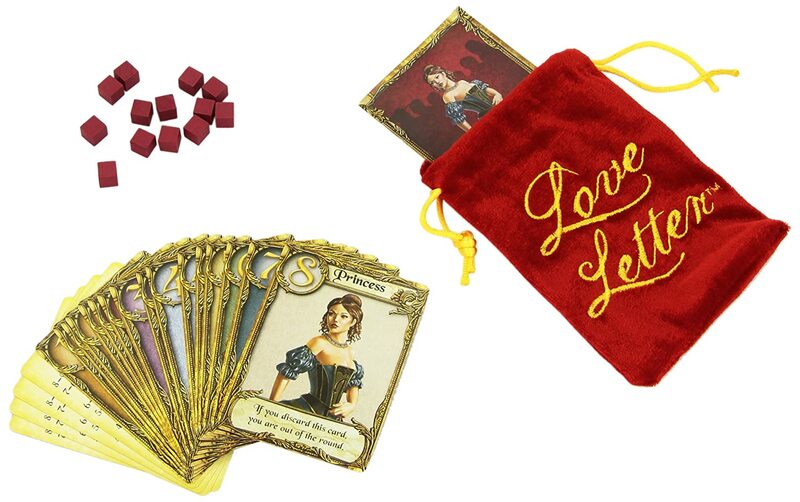 The game we were playing was called Love Letter (affiliate link). It took us a few minutes to wrap our heads around, but I ended up really enjoying it. With only two people playing, the rounds went rather quickly. I'd definitely play it again. Looking on Amazon, it seems like you can even get it themed in Batman and the Hobbit! There's also a Santa version of the game (affiliate link) that's only $3.15! The real reason I started writing this blog post was to tell you about the exciting packages I got in the mail today. A lovely blog reader sent me a book to read! 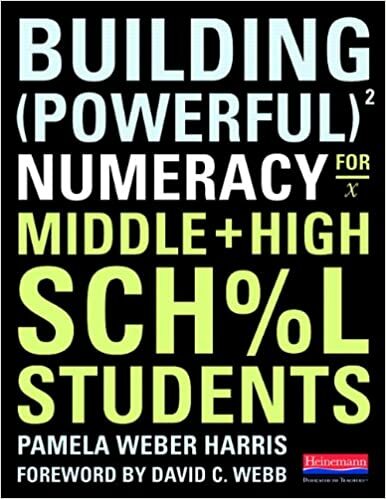 Building my students' numeracy skills is a major goal of mine, so I'm really looking forward to diving into Pam Harris' Building Powerful Numeracy book. I've heard it recommended over and over and over in the MTBoS! I also received a document camera from Ipevo. I've had a document camera since I started teaching, but it has recently stopped working. It wouldn't even power on! Due to the school's budget cuts, I knew that it probably stood no chance of getting repaired or replaced any time soon. Remember: I'm teaching at the school that forces all the teachers to leave by 4 p.m. to conserve electricity costs! I remembered hearing a few years ago that Ipevo had a program where they gave teachers free document cameras. It's actually called the Ipevo Wishpool. This month, August, just happened to be another document camera giveaway. They give away different products during different months. (It's still August, so if you need a document camera for your classroom you could still win one!) You do have to write a short essay explaining why you need it and how you will use it. 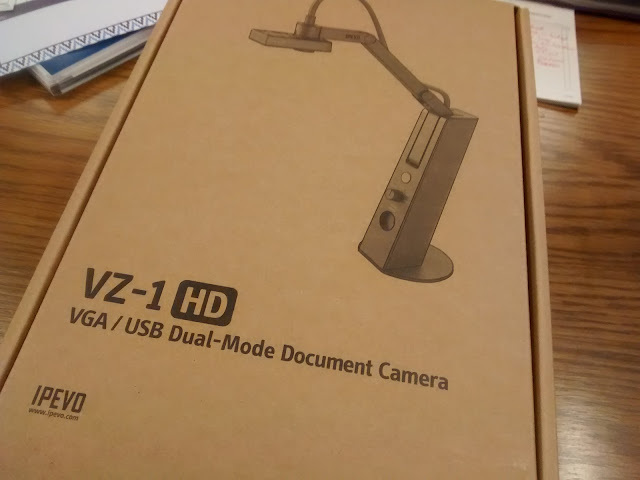 This month's gift is a VZ-1 HD VGA/USB Dual-Mode Document Camera (affiliate link). It was super easy to set up. I love that it takes up so much less desk space than my old SMART Technologies document camera! Not everyone wins. Shaun requested one from Ipevo the day after I did, and my wish was granted and his wasn't. :( But, I think it's definitely worth a try if you think you could use one in your classroom! Mine came in the mail today, and I already have it set up. 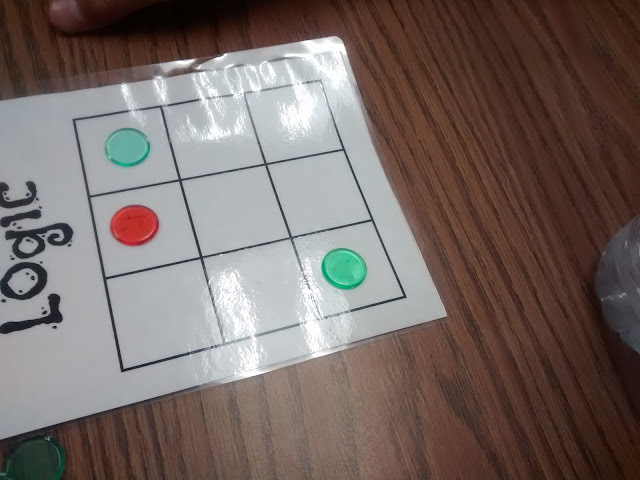 I used it to demonstrate to my students how to play the Traffic Lights game from Nrich that Julie Morgan blogged about. 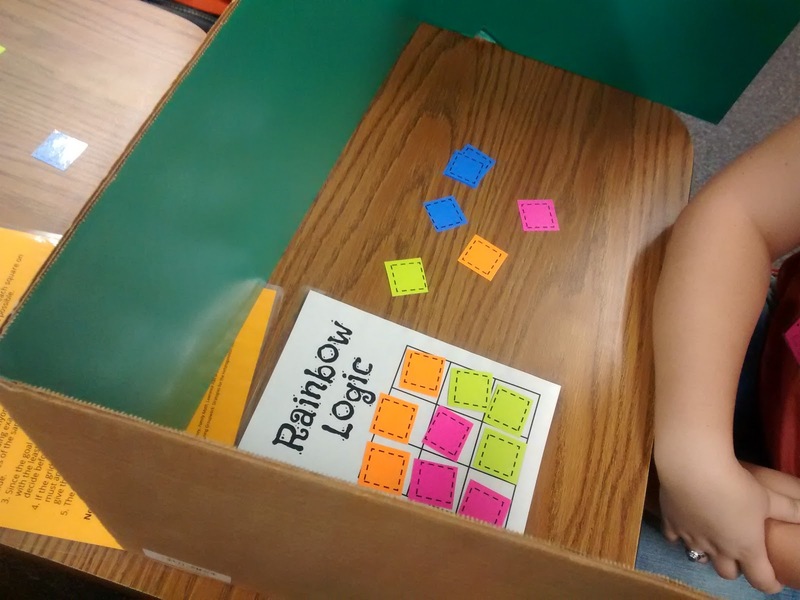 I had my students reuse the boards for Rainbow Logic for this activity. But, I think I'll make up a dedicated set of boards for this activity in the future that has the rules printed on them! 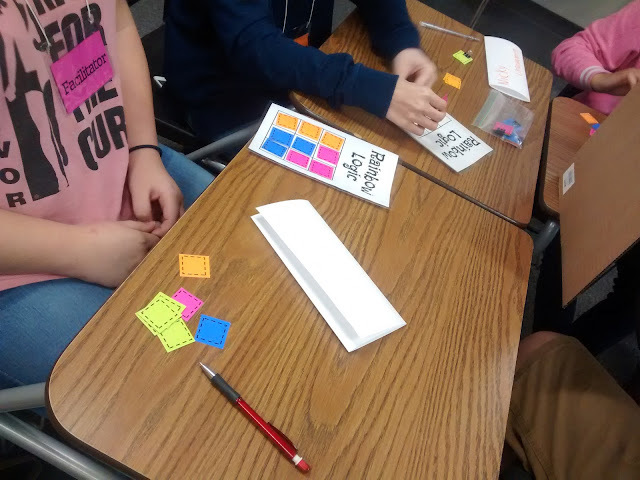 My Math Concepts students (students not yet ready for Algebra 1) really struggled with understanding the rules of the Traffic Lights game. But, my trig students got really, really into it. We ended up setting up a quick bracket and having a Traffic Lights tournament! I'm not entirely sure what to blog about. After a long, trying day of teaching and a forty-minute walk around the neighborhood, I don't exactly have the energy to recap everything we did today at school. All of my classes are in different places at the moment which both makes things very exciting and super complicated. When each class comes in, I have to have them remind me exactly what we did the previous day. One good thing that results from this is it means I've been able to use almost all of the group work activities I prepped this summer. My students just each got introduced to a different subset of those activities. So, I guess here's a quick overview of what went down today. * Some classes completed Rainbow Logic. I'm realizing just how much practice with logic they need. I challenged them to figure out the grid in as few questions as possible. SO many of the groups took this to mean "Ask two questions and guess where things go after that." Then, they would brag about solving the puzzle in only two questions. Yeah, if you ask two questions and then every group member "guesses" a different solution, one of you will probably guess it correctly. Of course, they insisted that they weren't guessing. We need to work a lot on making informed decisions this year. Whenever group work hasn't gone as planned this year, I keep reminding myself that the activities aren't magic. But, they are revealing so many areas in which we need to work this year. And I guess that's exactly what I'm going for during these first few days of school. 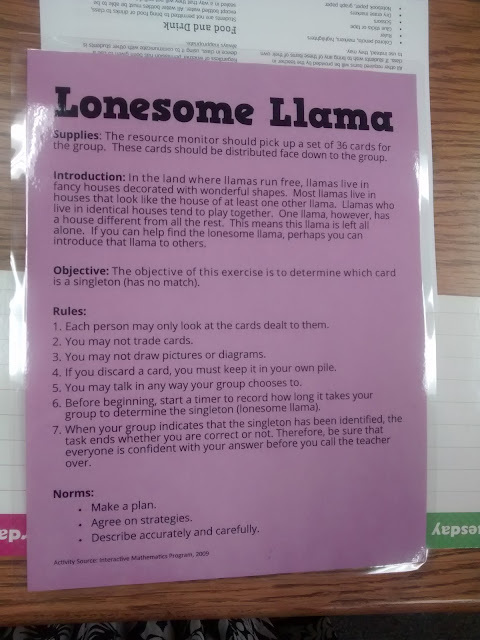 * My trig students completed the Lonesome Llama project from IMP. This took waaaaaaaaaaaayyyyyyyyy longer than I thought it would. One group figured it out in 32 minutes with one wrong solution along the way. My other group also worked for about 30 minutes, but they were only able to present me with 3 different solutions. 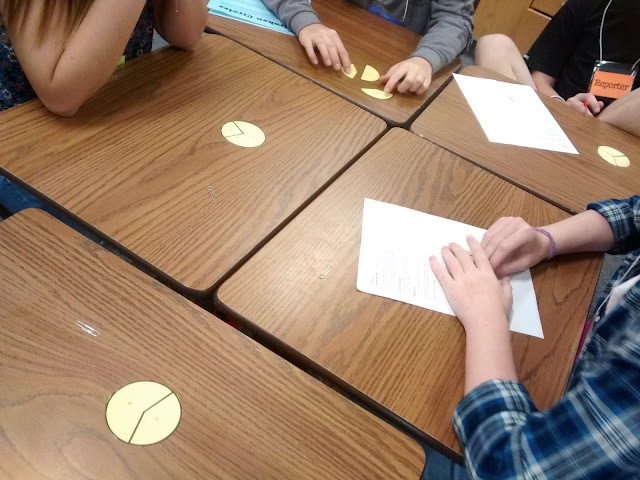 The one problem that plagued this group was that they didn't notice some of the cards had octagons while others had hexagons. After doing it with juniors/seniors, I'm too scared to do it with my freshmen. 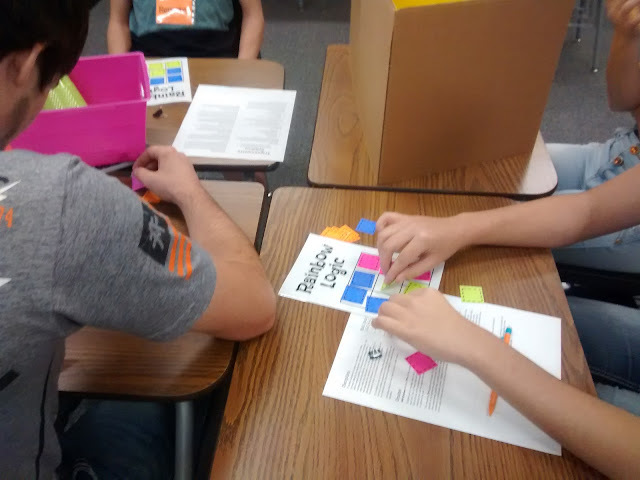 This activity did keep this group super engaged. And, I got to eavesdrop on a lot of student communicating and plan making/revising. 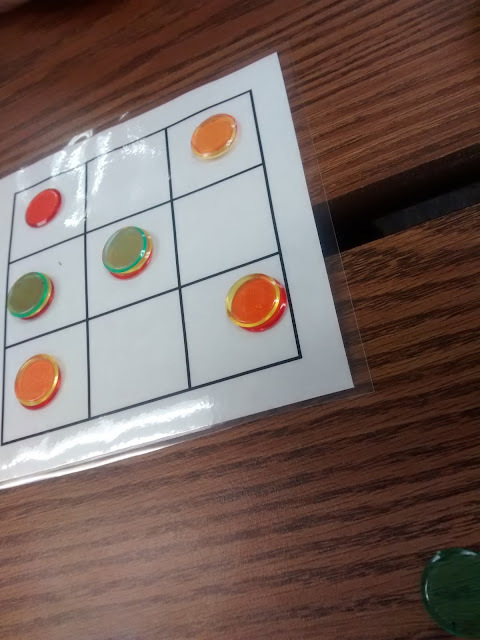 * Another of my classes played Guess My Rule. Again, I realized just how much practice my students need with logical thinking. Instead of trying out different cards and making sure their rule was absolutely correct, they were just blurting out a million rules and hoping one of them would stick. I wish I could police this better, but there is only one of me and so many groups of them. * Guess My Rule only took about half the class period, so we worked on Build It for the last half. I learned about Build It from Stanford's website. The activity is from the book Get It Together: Math Problems for Groups Grades 4-12 (affiliate link). Each student was given one or two cards. 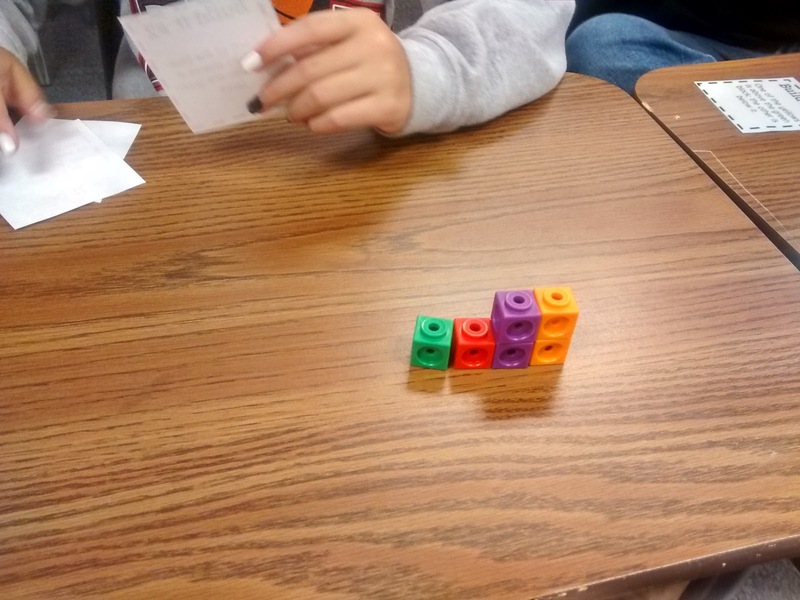 Without showing their cards to their teammates, they had to use their linking cubes to build the prescribed object. 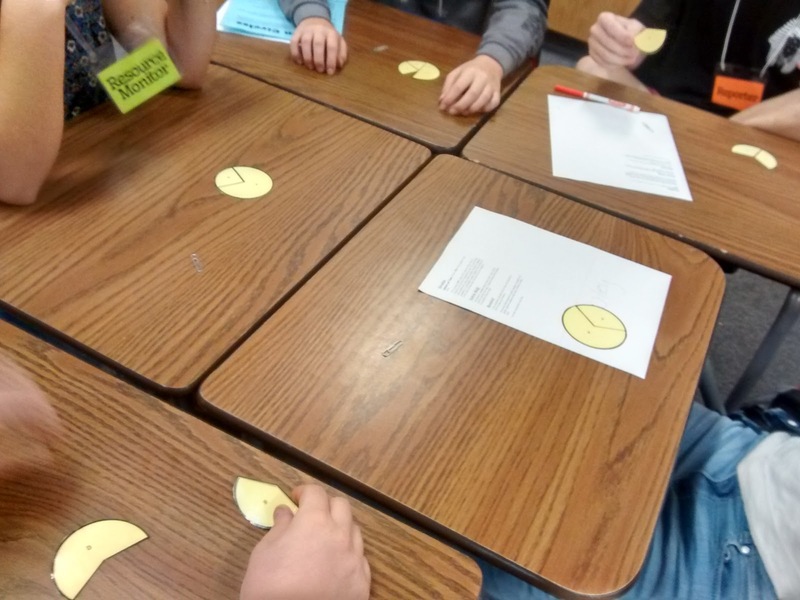 My students struggled with this activity at first, but as the activity continued they definitely got into it. They were so excited when they figured out each puzzle. I'd definitely like to do more activities like this! * I had the "five minutes left and not enough time to do the next activity" scenario happen a few times today. With one class, I challenged them to "Count to Ten" as a class. No talking allowed other than saying numbers. If two people (or more!) say the same number at the same time, the class has to start over again at 1. My first period was really struggling with this until a student yelled out that they should raise their hands before they said a number. 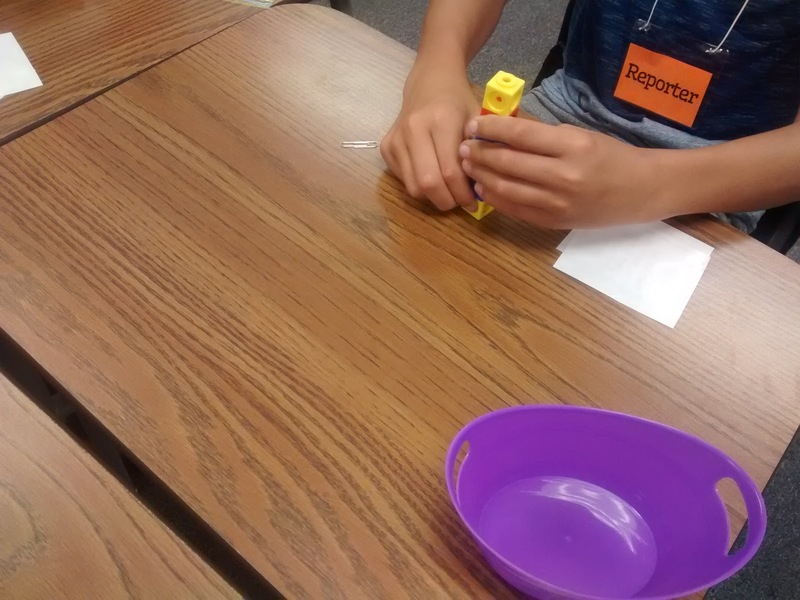 This helped them complete the activity, but they weren't supposed to talk. So, it kind of defeated the purpose of the activity. 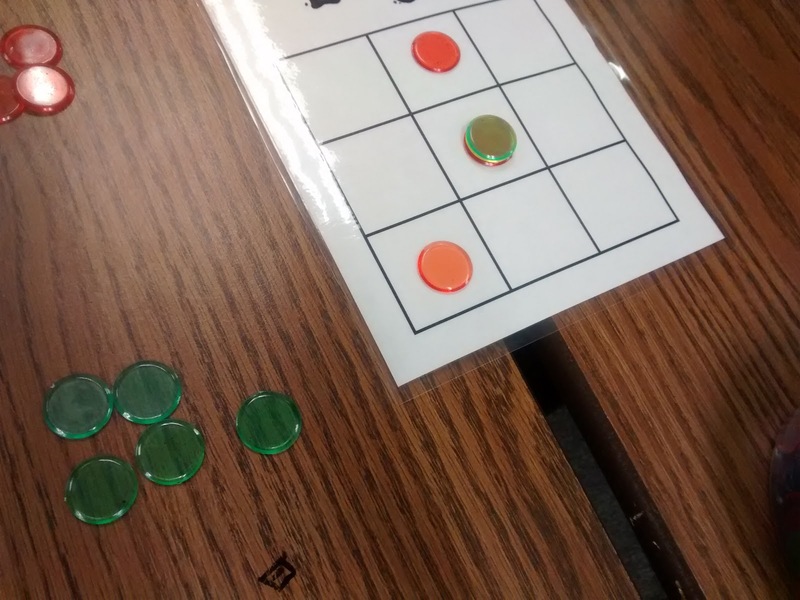 * The other time filler activity I utilized today was Julie Morgan's Thirteen game. 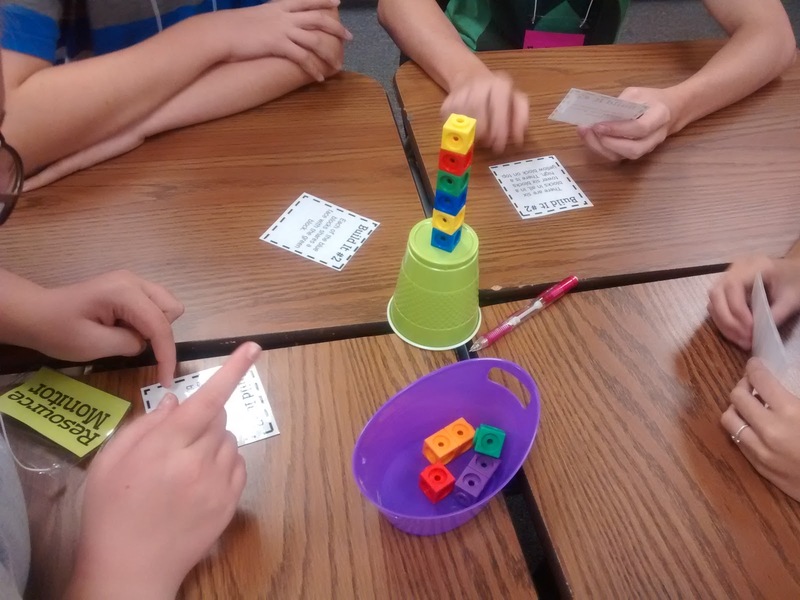 The kids really enjoyed this activity, and they begged to play again. It's a definite keeper! There are also a bunch of other great ideas in the same post! And, this is only what went on in my math classes. Physical science is another story. But, we didn't finish, so I can get away with blogging about it tomorrow! Today, I had grand plans to go over the syllabus, complete Broken Circles, and complete Rainbow Logic in one fifty minute class period. 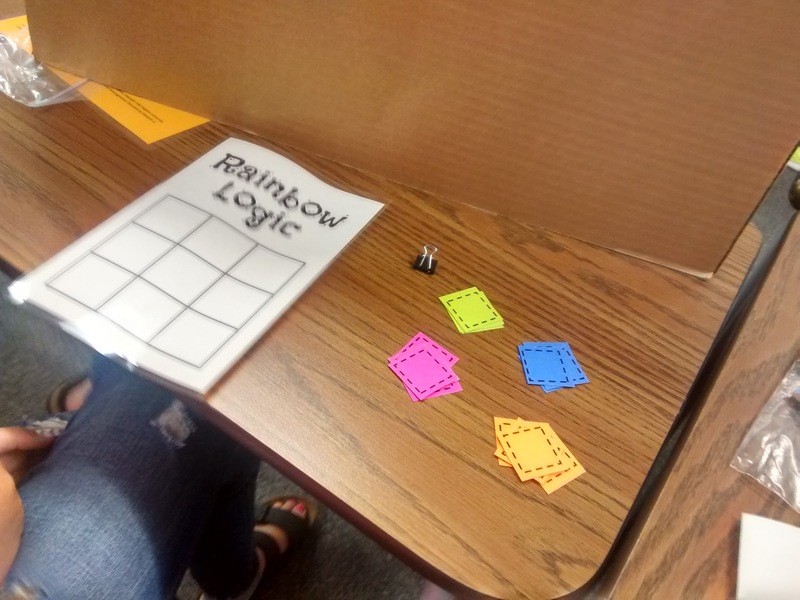 In two of my math classes, we did the syllabus, Broken Circles, and PART of Rainbow Logic. In my other three math classes, we only did the syllabus and Broken Circles. Oh, and I also gave students back the quizzes they wrote for me yesterday to have them graded. This question broke my heart. You'll notice that I chose to write my own answer in. After talking through our syllabus, I introduced my students to the four group work roles we'll be using this year. Silly me thought that I could just go over the four group roles, hand my students the Broken Circles task card, and set them to work. Let's just say I ONLY made this mistake 1st period. With each subsequent run-through of the activity, I found that how I was introducing/setting up the activity with my students was becoming much more effective. The "No talking" and "No pointing or hand signals of any kind" rules were SUPER hard for my students to follow. This really wasn't a surprise, though. There was much frustration among the students. Kids would call me over and tell me that I must have cut the circles wrong because the activity was impossible. I assured them that the activity worked and pointed to the other groups that had already finished. After blogging/tweeting about this activity, I had a lot of people try it and out let me know how long the activity took on twitter. They all advised me that small groups (especially groups of three) could finish the activity in as little as 2 minutes. 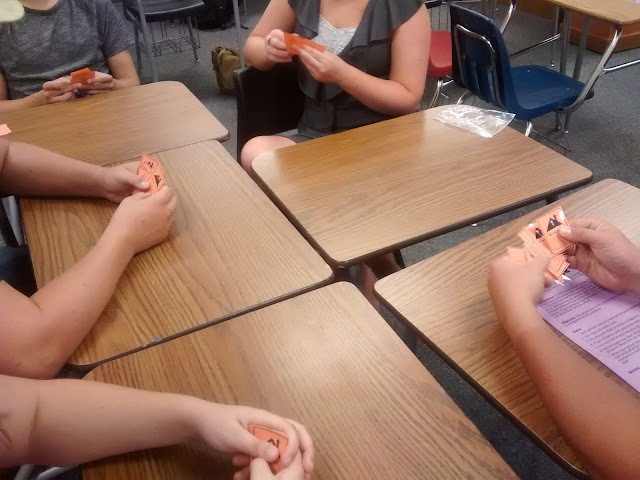 I arranged all of my students in groups of 4, 5, or 6 to keep them engaged for a bit longer. I never timed my students, but I would guess it took groups 4-8 minutes to finish. Then, I had them complete the reflection sheet as a group. It was so fun to watch the groups celebrate together after finishing their circles. Since they were still in "no talking" mode, almost all of the groups raised up their hands in celebration. After working through Broken Circles, I found that they adjusted to Rainbow Logic a bit better. I think it could have gone even better if we hadn't been so rushed for time today. 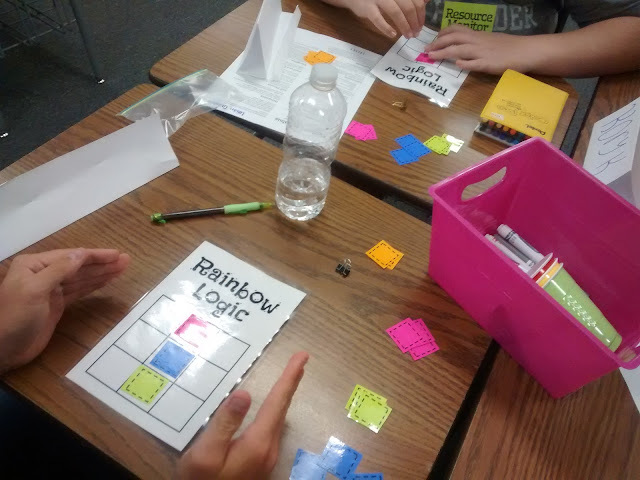 One group really impressed me with how well they were playing their roles during the Rainbow Logic activity. I borrowed dividers from my neighbor teacher to help the grid keeper hide their designs. 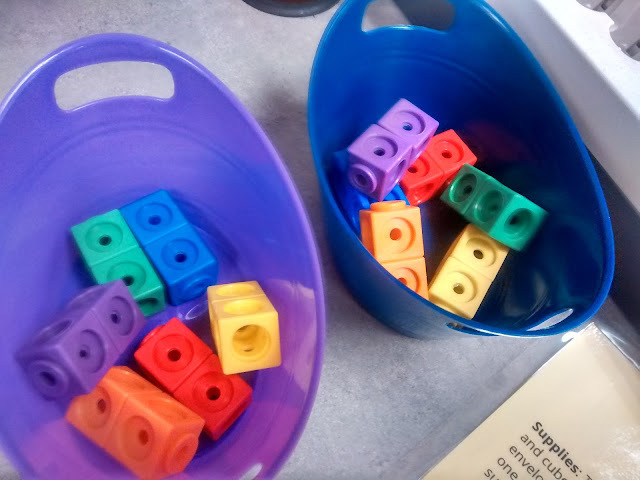 As groups worked to figure out the color placements, I challenged them to see if they could figure out the solutions in smaller and smaller numbers of questions. One group in my trig class really impressed me by figuring out the pattern of the entire grid in only TWO questions! My freshmen didn't have as great of discussions as my trig students, but I think that comes with age and maturity. My trig students were really good at discussing their questions and making sure it was a group question. My freshmen still need a lot of work on that. One student would just blurt out a question, and the group would go along with it. Just shows me another thing we need to work on! I ended up really, really, really loving this activity. I think it's a definite keeper! Well, Day 1 of Year 5 is in the books. I haven't spent this long on my feet in a while, so I'm definitely feeling exhausted. The first task I set my students (minus my trig students whom I've all taught before) was to make a name tent to set on their desk. I have SO many freshmen this year which means SO many new names to learn! 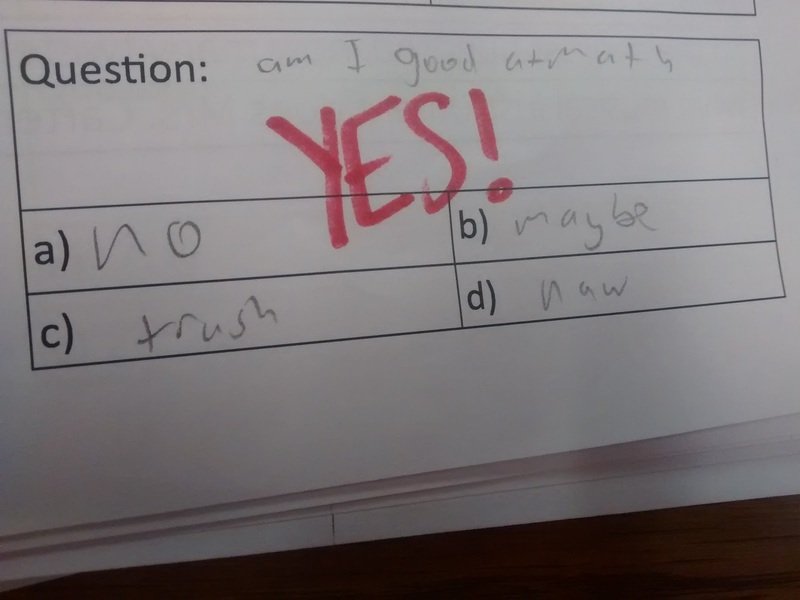 Next, I gave my students their first quiz of the year. This caused some major groans! After three minutes, I went through set of slides to reveal the answers. I gave the student in each class period who got the most questions correct a certificate and a piece of candy. Then, I turned the tables and had them write a quiz about themselves for me to take. Next, we talked about what supplies they would need. I gave out quarter sheets of paper with a supplies list. I intentionally chose not to discuss the syllabus today. 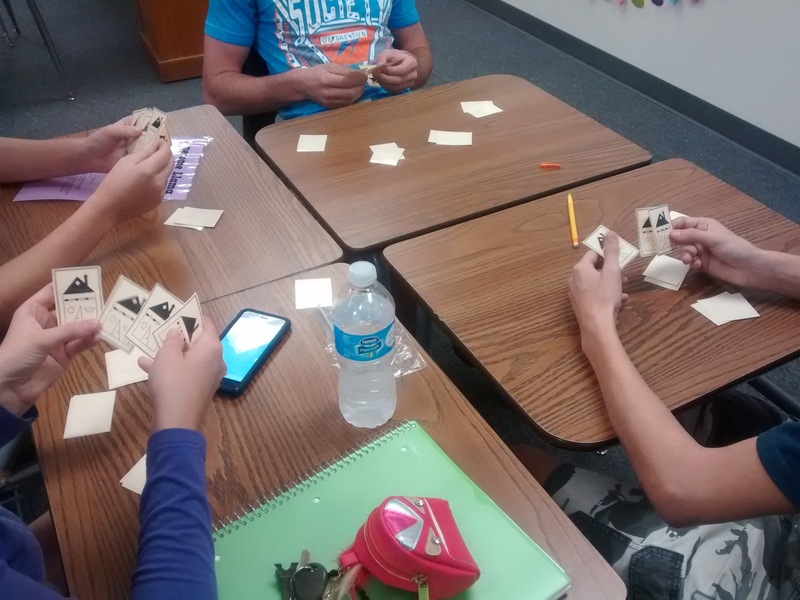 I wanted to keep my students active and engaged instead of having them sit and listen to me going on and on and on. 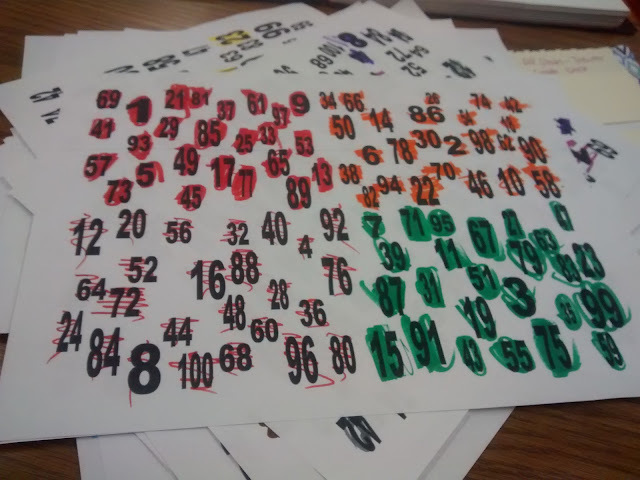 Our main task for the day was Sara VanDerWerf's 1-100 Activity. 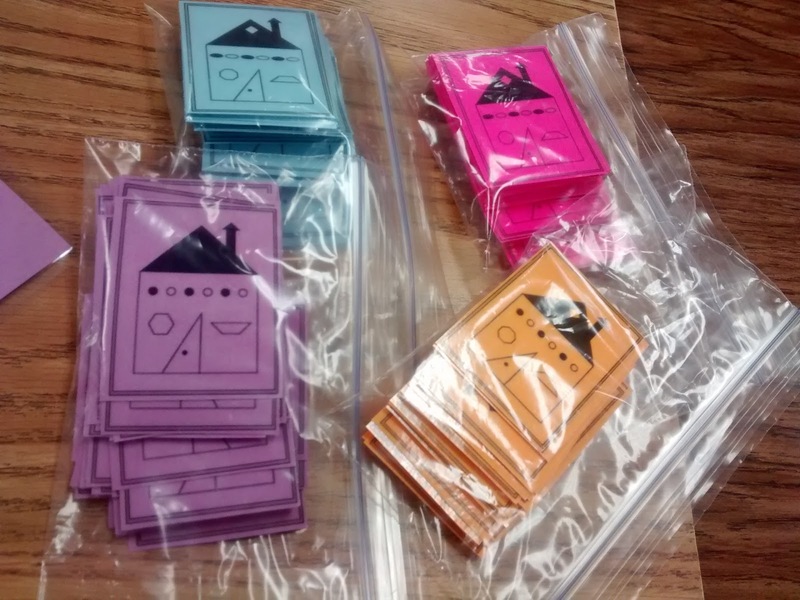 If you haven't read her blog post about this activity, stop everything else and do it now. 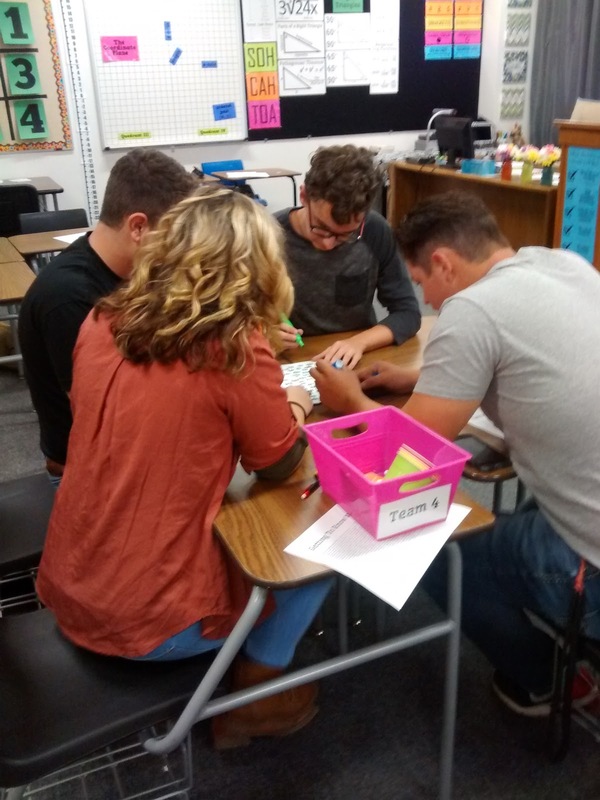 I decided to do this activity on the first day because it really emphasizes and starts a discussion with students about what makes group work effective. 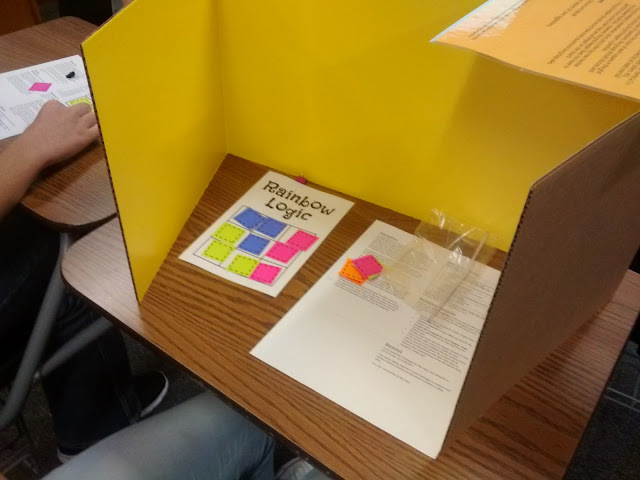 Tomorrow, we'll start delving into more of the nitty-gritty of group work by working through Broken Circles and Rainbow Logic from Elizabeth Cohen's Designing Groupwork: Strategies for the Heterogeneous Classroom (affiliate link to 2nd Edition / 3rd Edition). This meant I was able to introduce group work on Day 1, and I'll introduce group work roles tomorrow on Day 2. 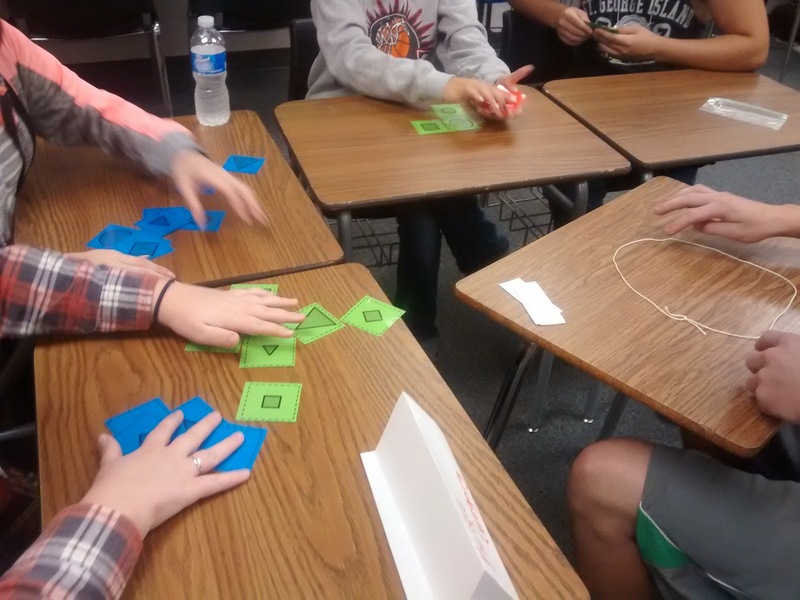 I've never seen my students as engaged as they were during this activity. It was like magic! This activity is most definitely a keeper. I can't recommend it enough! The kids were super-engaged, and they didn't want to stop. We did the 1-100 activity twice with a one minute break in between to discuss strategies in our groups. After the 1-100 activity, I asked students to share what this activity demonstrated about effective groupwork, and they actually had responses. This is the type of question I'm used to asking and getting dead silence in return. 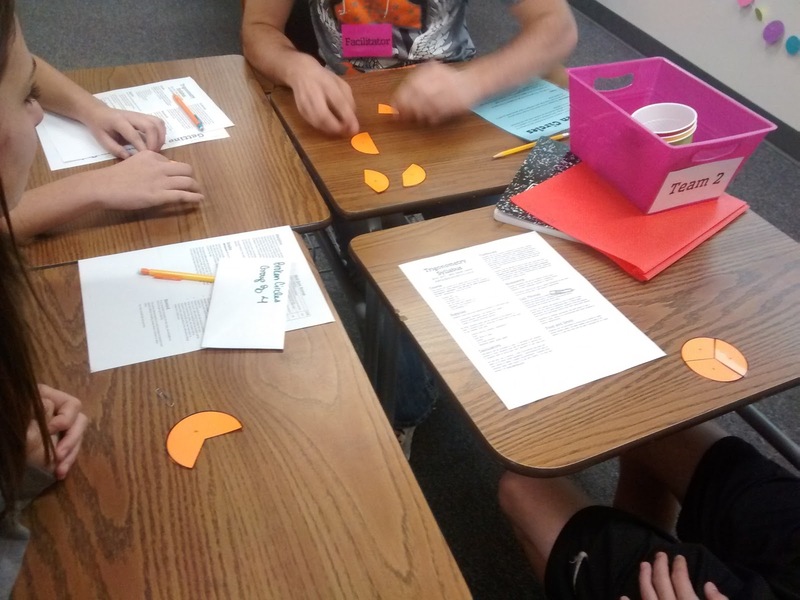 With some of my classes, this activity took us to the end of the class period. With others, we still had 10-15 minutes left over. Most of this difference between classes can be attributed to widely varying class sizes. With my classes that finished early, I introduced them to the game of Petals Around the Rose. Students also sign their name to my Petals Around the Rose poster that hangs in my classroom. 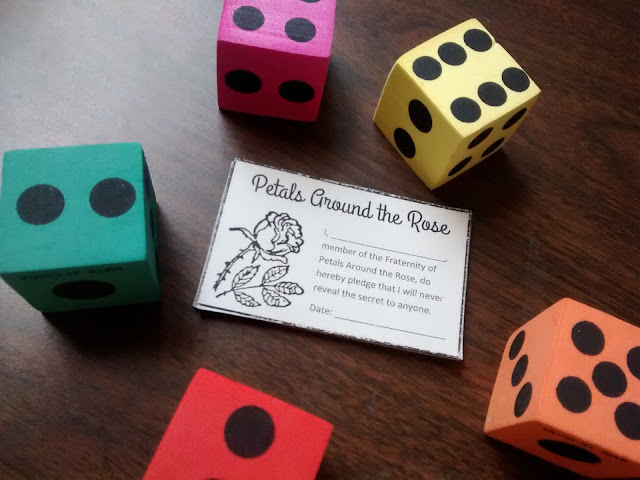 With my stats class, they had already done Petals Around the Rose last year, so I decided to have them play Left Center Right (affiliate link) instead. 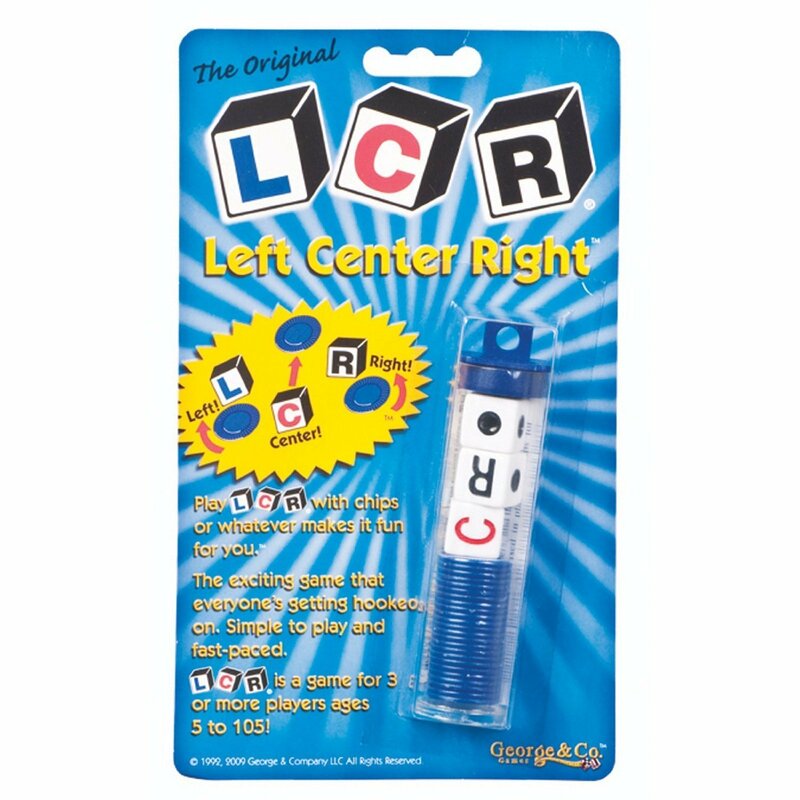 I actually had more students than the chips in the tube allow to play, so I used colored bingo chips (affiliate link) in lieu of the chips in the tube. We sat in the floor in a giant circle and played for a good 10 or 15 minutes. I thought my students (juniors and seniors) might think it was a lame game, but they got really into it. They even asked if we could play again some time. 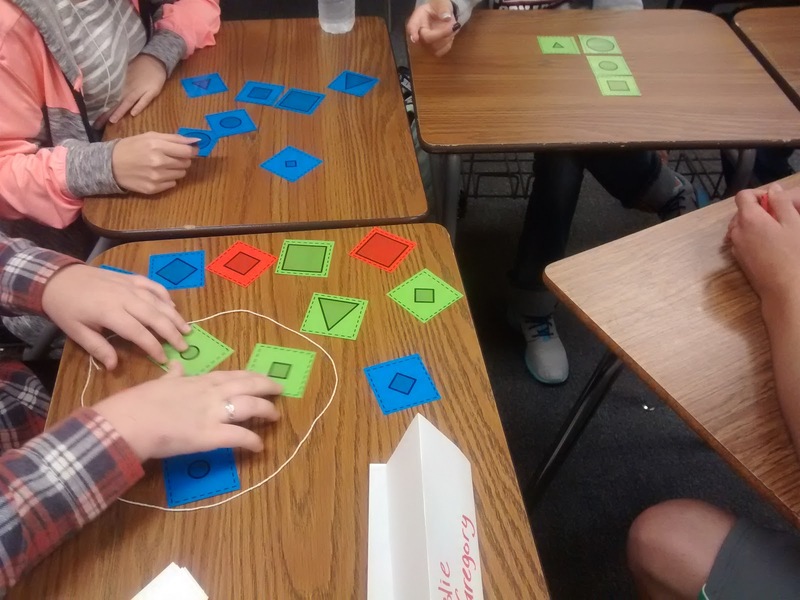 This game is actually more stats-related than trig-related, but it was a fun community-building game for my small class. As for my physical science class, I had to plan an entirely different lesson for Day 1 since almost all of my physical science students are also enrolled in one of my math classes. 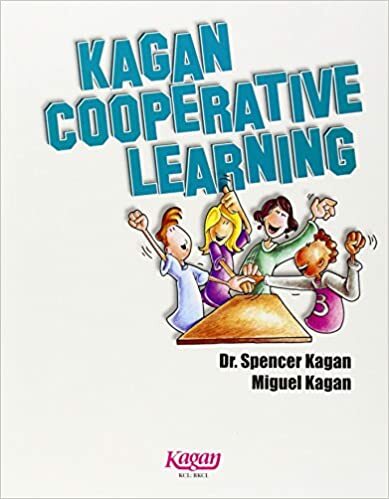 We started the "Survival in the Desert" activity from Kagan's Cooperative Learning book (affiliate link). Though, a search for this activity on google shows that it is included in numerous books. See here, here, here, here, and here. Sadly, we didn't get to finish the activity. I blame that mostly on the fact that my entire class was pulled out for an assembly during the middle of class. I liked this activity, but I had to rewrite it since the original version mentioned both cigarettes and alcohol. I can't have my students going home after the first day of school and saying that they learned about vodka in physical science class. Here's my edited scenario. I did notice today that I missed a period in the first paragraph. Now, that's driving me crazy! I had students fill out an individual ranking sheet that I printed two-to-a-page. I had to make the ranking from 1-14 instead of 1-15 because I deleted the alcohol from the story. Then, I had students complete a group ranking sheet together. 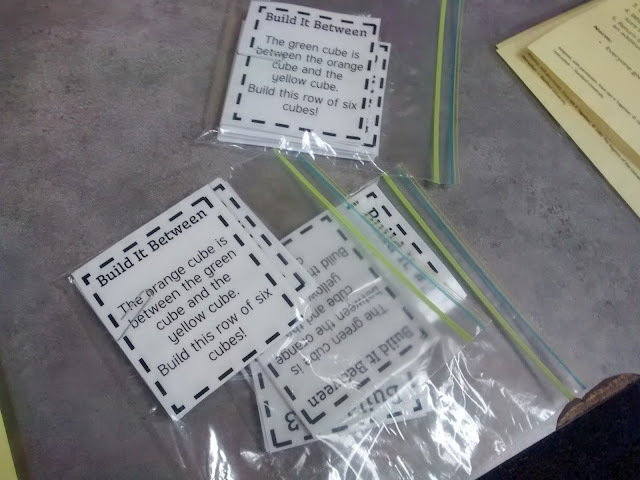 You can find my files for this activity here. Today was also the first day of my school district's out of the door by four policy. The principal came over the intercom at 4 p.m. and instructed us to go home. It's part of my district's plan for saving money this year. I've never been a leave school early person, so this is going to be quite an adjustment for me. Shaun and I did take advantage of the fact that we got out of school at a reasonable time by coming home and going for walk around the neighborhood while we talked about our days. It's part of our attempt to fit more exercise into our daily routines. I'm sure there's more that I could write about today, but it's getting late. And, I'm first-day-of-school exhausted. Meet The Teacher Night = DONE!